Zenith Horizon: Size Constancy and the Moon Illusion. 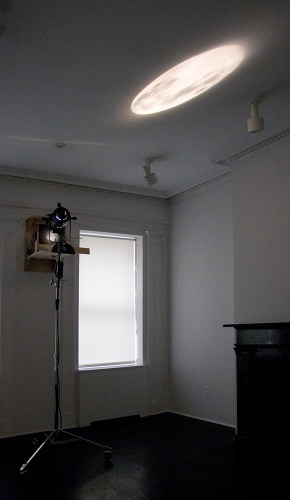 A theatrical light projects an image of the moon onto a rotating mirror. As the mirror reflects the moon across the ceiling and down the wall, its scale increases mimicking the moon illusion. This piece was made in response to Ohad Meromi’s performance The Meromi Method which was included as part of the exhibition Staging the Phenomenal Character.